July 16, 2017 - Best Wedding Ever! Home »Blogs »Phyllis Sinoradzki's blog »July 16, 2017 - Best Wedding Ever! 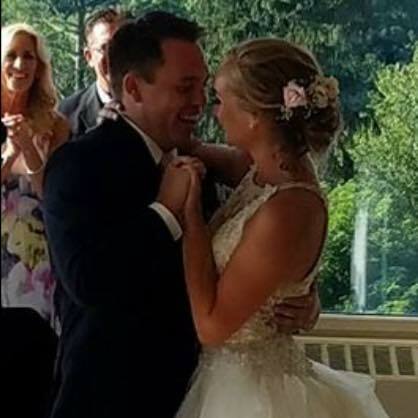 I may be a bit prejudiced, but the wedding between Richie Sinoradzki and Kristen Schmalbach was wonderful for so many reasons. First, Richie is my grandson. That made it so special for me. The way they asked me to officiate their wedding in New York happened this past Christmas. Richie and Kristen came to Marco Island and Naples for the holidays. We were at a restaurant having dinner with Richie's father, who is my son, and his lovely wife, Beth, and my fourth son, David. After exchanging gifts, mine was last. In addition to a big gift, they gave me this little box. In the box was a net bag. When I opened the net bag and let the contents spill out, to my surprise, it was a puzzle! I put it together as everyone was watching intently and the message was in an oval of flowers. The lettering was centered. Grandma Will you officiate our wedding? love, Kristen & Richie 7.16.17 Needless to say, I was ecstatic! and gave them a wowing YES!!! Many of the wedding guests stayed at the Marriott's Spring Hill Suites. When they arrived, there was a gift bag with water, cookies, and other goodies. We were also invited to a yoga class Saturday and the men including the groom went golfing. We were all preparing for the next event which was the pre-wedding dinner Saturday. On July 15, Rich and Beth Sinoradzki (father of the groom) hosted a wonderful pre-wedding dinner for close friends and family at a restaurant in Poughkeepsie, New York. We had champagne, wine, hor doeuvres, buffet dinner, and cake on a stick! It was outstanding. Rich and Beth had wedding wrapping made with the bride and groom's personal photos on it and they also gave them a huge blanket with their favorite photo on the blanker from their engagement photos. Cute games were played and prizes awarded. It was an outstanding evening. The bridesmaids, Richie's mother, his step-mother, and I were invited to have our hair and makeup done on Sunday morning, the day of the wedding day which was held at the Garrison Country Club in Garrison, New York. It was outdoors with a lovely arch and chairs set up for 100 people. My sons, Steven and Jeffrey walked me down the aisle to officiate the wedding, and my son, David walked me out at the end of the ceremony. Rich and Beth walked together after me, followed by the rest of the bridal party including Rich's mother, Susan. The ceremony went well and Richie and Kristen wrote their own vows to each other. There were few dry eyes. It was awesome. The cocktail hour began, photos were taken all evening, and at 6 p.m. it was time for dinner. They had a great DJ, photographer, and videographer. It was so wonderful to see everyone having such a great time, and especially for me, having performed the ceremony and having my four sons there together with my lovely daughters-in-law. We all had stayed at the Marriott's Spring Hill Suites, so after the reception was over, many of us gathered around the outdoor fire pit and cooked smores and reminisced about the weekend including Kristen and Richie. All in all, it was the best wedding I ever had the privilege of attending. For more pictues, please visit my Weddings by Phyllis Facebook page and look at the July Albums.